It was a tale of two halves in Winston-Salem on Sunday afternoon, except they weren’t your traditional halves. If the first and fourth were the best of quarters the second and third, while not necessarily the worst, could easily be said to be lackluster. 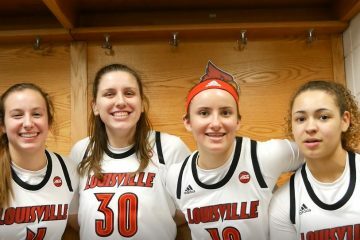 But starting strong and finishing strong would prove to be more than enough as the Cardinals improved to 17-1 and 5-1 in ACC play with a 73-49 victory over Wake Forest. Arica Carter would get things started by going 3-3 from beyond the arc in the first five minutes against the injury-depleted Demon Deacons squad. For a time this would be the primary source of Louisville’s advantage on a day where Carter would lead all scorers with 12 while going 4-7 from three point range. Carter’s heart may be in L.A. but her shot seems to prefer the Carolinas as this was a near repeat of her showing versus Duke just two weeks prior. But the hot start would be followed by two consecutive quarters of Cardinals on cruise control. Asia Durr was scoreless in the first half, but that seems to make no difference for a team averaging 17 assists per game and put up 19 in both this and Thursday’s contest. Yet it was the contrast of Wake’s turnovers and a return to Louisville’s rebounding woes that kept Wake within striking distance into the fourth quarter. The Deacs would end the night with an embarrassing 26 turnovers which the Cardinals translated into 26 of their 73 points. 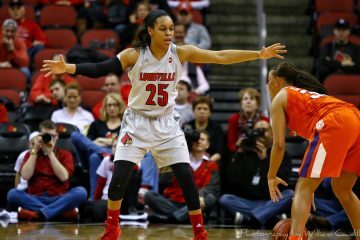 But the 15 rebound advantage Louisville had against Virginia was more than reversed as the Cards would be out-rebounded 45-25. As such, quarters two and three devolved into a contest of runs. Wake would in fact cut the lead to four on a six to nothing run to start the third quarter to put the Cardinal faithful on edge. But each Wake run would be answered by a Louisville run, and vice versa. 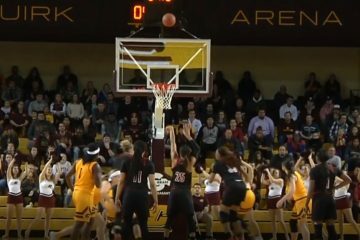 Yet the highlights of the third quarter would be indicative of the outcome as Asia Durr at last joined the scoring ranks with an intercepted pass and layup. While points off turnovers maintained the lead, the Cardinal three point shooting extended it. Durr would sink two consecutive threes joined by Carter’s one to go on a quick 9-2 run in the third as they combined with Evans, Robins, and Duvall to make the final tally 10-25 from beyond the arc for the afternoon. By the fourth quarter, it was clear the Cardinal onslaught was beginning to wear down the Demon Deacons. Sophomore Ivana Raca would do her best in place of the injured Sharp and Penna with 11 points and three assists but it was not enough. 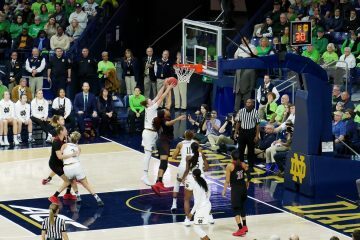 For the Cardinals, Mykasa Robinson would continue to extend her recent slew of minutes with solid play and increased the Cardinal lead to 20 with a dribble-drive to get the layup and the foul with six minutes remaining. Wake Forest could no longer find the answer and thus were outscored by 10 in the fourth quarter to make the final score 73-49. Answers will have to be found for the rebounding issues before Thursday night in Tallahassee. This season has demonstrated a tendency for the Cardinals to go quiet in at least one quarter and allow teams to claw their way back into the fight. While scoring droughts were not a major factor in today’s contest, the -20 rebounding margin continually allowed Wake Forest to stay within striking distance in a game that could easily have been decided by halftime. 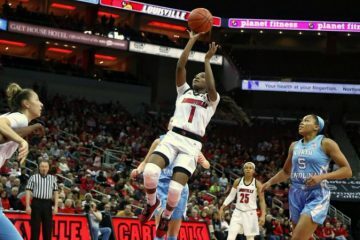 The Cardinal’s 19 assists, led by Jazmine Jones’ eight, continue to be a bright point as Louisville nearly had a second consecutive game with all 11 players on the board. But as Jeff Walz has stated, scoring by committee is not his concern. Rebounding by committee is.